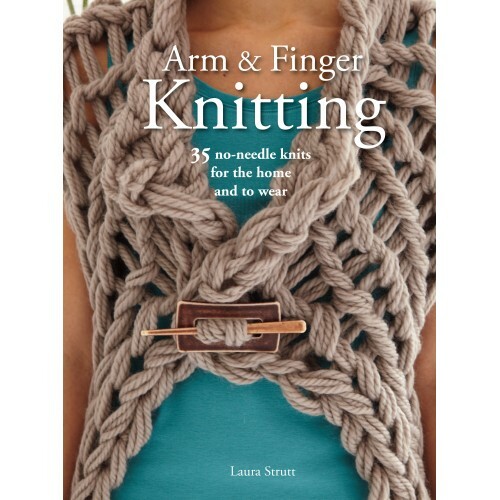 If you like large-scale knits or you appreciate the bigger stitches and open texture you can achieve by knitting with your arms or fingers, then you will find plenty of inspiration in ‘Arm and Finger Knitting’. Breaking free from the constraints of normal needle sizes, Laura Strutt demonstrates how to do all the usual stitches and techniques using just your arms and hands, from plain garter stitch to moss stitch, increasing and decreasing, and knitting with two or more strands of yarn at a time. To make the best use of the unique texture and scale of no-needle knitting, she has designed 35 stylish projects for you to make, for the home and to wear. There are stylish arm-knitted scarves and throws, but also a simple stool cover, a stylish gilet, and a shawl you can knit in under an hour. Using finger knitting, you can quickly create place settings, a bath mat, and even a necklace. A photographically-illustrated step by step guide to techniques covers everything you need to know, from casting on to cabling, clearly and simply. It’s no wonder there is so much interest in arm and finger knitting when you can get spectacular results in such a short time.